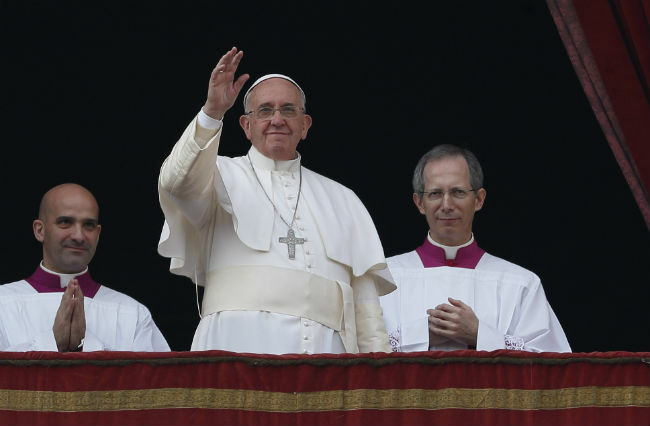 Before giving his solemn Christmas blessing “urbi et orbi” (to the city and the world), Pope Francis addressed an estimated 80,000 people in St. Peter’s Square, urging them to pray for peace in Ukraine, in the Middle East, Nigeria, Libya, South Sudan, Central African Republic and Congo. With thousands of children looking at the Vatican’s Nativity scene and receiving the pope’s blessing with their parents Christmas morning, Pope Francis’ strongest words were about less-fortunate children. “May Jesus save the vast numbers of children who are victims of violence, made objects of trade and trafficking or forced to become soldiers,” he said. He added special prayers for the families of the dozens of children killed Dec. 16 by a Taliban attack on a school in Peshawar, Pakistan. “There are so many tears this Christmas, together with the tears of the infant Jesus,” he said. Children are dying “under bombardment, even there where the son of God was born. Today their silence cries out under the sword of so many Herods,” those who kill children just as Herod did in Jesus’ time. In the dark of the night Dec. 24, in a St. Peter’s Basilica filled to capacity, 10 children led Pope Francis toward the altar of the church. Together they stood waiting while a lector read the solemn “Christmas proclamation,” recounting the timing of the birth of Christ in human history. As the children from the Philippines, South Korea, Belgium, Italy, Lebanon and Syria looked on, Pope Francis removed the cloth that had been covering a statue of Baby Jesus. He bent over and kissed it gently. As the “Gloria” was intoned at the Mass, the bells of St. Peter’s Basilica pealed; those inside the church heard a slightly muffled version, but the thousands of people watching on video screens in St. Peter’s Square got the full effect. Later, during Communion, priests came out of the church to distribute the Eucharist to those unable to get inside. Another musical note came in the midst of the Gregorian chant of the Creed. After the line, “For us men and for our salvation he came down from heaven,” an orchestra, conducted by Manfred Honeck of the Pittsburgh Symphony Orchestra, began playing. Chen Reiss, an Israeli soprano, sang Mozart’s “Et Incarnatus Est,” which the Vatican said was a special request of Pope Francis. Shortly before the Mass, taking advantage of the satellite link of a crew from the Italian bishops’ TV2000, Pope Francis made a telephone call to Christian refugees gathered for Mass in a camp in Ainkawa, Iraq.